Pediatricians Caution Parents Against 'Fever Phobia' : Shots - Health News A leading group of pediatricians is counseling doctors and parents against going overboard in treating mildly feverish kids with over-the-counter medicines. The pediatricians say keeping children comfortable should be the goal rather than reducing their temperatures to a particular number. Consider all the child's symptoms, not just temperature. A child running a fever is no cause for alarm, but that doesn't stop many parents from worrying — a lot. Now a leading group of pediatricians is counseling doctors and parents against going overboard in treating mildly feverish kids with over-the-counter medicines. The pediatricians say keeping kids comfortable should be the goal rather than reducing their temperatures to a particular number. Most fevers are caused by viruses and don't last long or cause any harm. 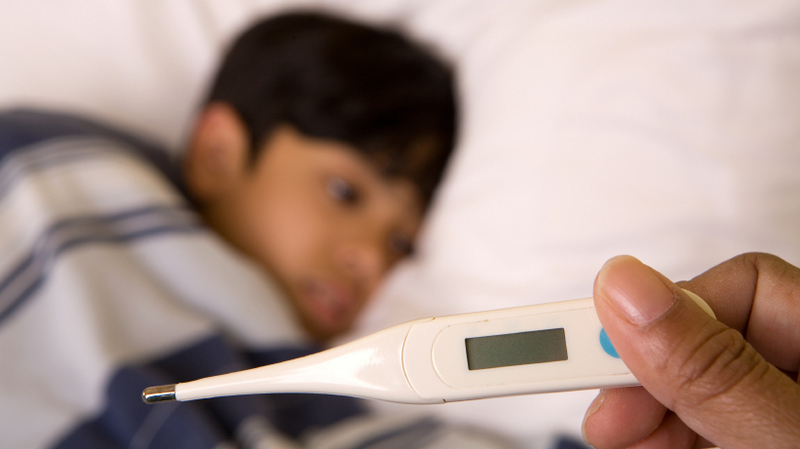 "There is no evidence that fever itself worsens the course of an illness or that it causes long-term neurologic complications," says the report in the latest issue of the journal Pediatrics from the American Academy of Pediatrics. Indeed, fever is one way the body fights infections. Still, parents often fret that even mild fevers can hurt their children. So they give them medicines, such as acetaminophen or ibuprofen, to keep their temperatures as close to normal as possible. Fever-related seizures are a common concern, but there's no evidence using anti-fever medicine can prevent them. About half of all parents incorrectly think a temperature of less than 100.4 degrees is a fever, and about one-quarter would give anti-fever medicines to kids with temperatures below 100 degrees. Most parents — 85 percent — would wake a sleeping child up to administer anti-fever medicine. That's a mistake. "If they're sleeping, let them sleep," Dr. Henry Farrar, co-author of the report and an emergency room pediatrician at Arkansas Children's Hospital, tells the Associated Press. The report doesn't include any specific recommendation on what temperature should trigger a call to the doctor. Overall, the report recommends that parents and doctors pay more attention to the full range of a child's symptoms to detect serious illness rather than focusing on temperature. Health care professionals, the report says, "should minimize fever phobia" and stress that anti-fever medicines don't prevent febrile seizures.